There’s a few things everyone has to do for the holidays. You have to take family photos, send out holiday cards and eat some sweets. Ok, maybe the last one is a stretch… but in my house it’s a necessity! LOL. Groupon sent out an email today and it was FILLED with holiday cheer. I wanted to point out a few great deals just in case you wanted to get started nice and early on your Christmas to-do list. Click here to receive 40, 70, or 100 Holiday Photo Cards from PhotoAffections (Up to 74% Off). This package is perfect for people who already have the photo they want to use for their holiday card. This is a pretty great deal btw! $18 bucks for 40 cards! amazing! 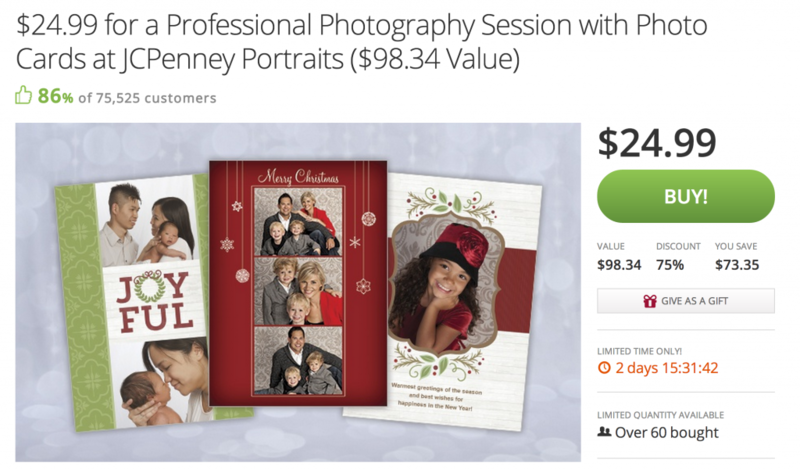 Click here to spend $24.99 for a Professional Photography Session with Photo Cards at JCPenney Portraits ($98.34 Value). This is the one I bought — $25 bucks for a session AND cards. Yes please…. And last but not least, click here to receive $11 for $20 Worth of Candy, Apparel, Decor, and Gifts from The Hershey’s Store. You know you are going to visit people this year. Here’s the perfect hostess gift. AND IT’S ONLY $11.